Diverse marine life, some fo the most pristine beaches in the country, and a portal into rich cultural traditions – find out why Sarangani is the consummate destination for culture and adventure. An archipelago of 7,641 islands strewn in the Pacific Coast, the Philippines is a wondrous waterworld where various bodies of water come into play. The province of Sarangani in the southern tip of Mindanao is a shimmering example why the country is the ultimate natural playground for lovers of water—whether it be for aquasports or simply frolicking in the refreshing splash of sleepy shores or rushing rivers. Embraced by the lush Sarangani Bay, this southern getaway is an unheralded destination that has continually dazzled beach bums. Declared a Protected Seascape and a Key Marine Biodiversity Area by the Department of Environment and Natural Resources (DENR), it is a gigantic 226-kilometer cove of what feels like an infinity of enthralling beach escapades – both above water and beneath. The bay’s surface area of 215,950 hectares boasts a 2,293-hectare coral cover spread over 20 reef areas with some 60 live hard coral genera, 411 reef species, and a 912-hectare seagrass cover. With these lush marine diversity, it has been named by the Department of Tourism as the scuba diving haven of Soccsksargen Region. Scuba divers will be mesmerized by the remarkable assemblage of coral and aquatic life at the so-called Tinoto Wall right below Lemlunay Resort in Maasim town, the province’s top dive spot. Within the municipal waters is Maasim Reef, which abounds in of juvenile white-tipped sharks, huge fan corals and gigantic bat fishes, and astounding gardens of marine flora. 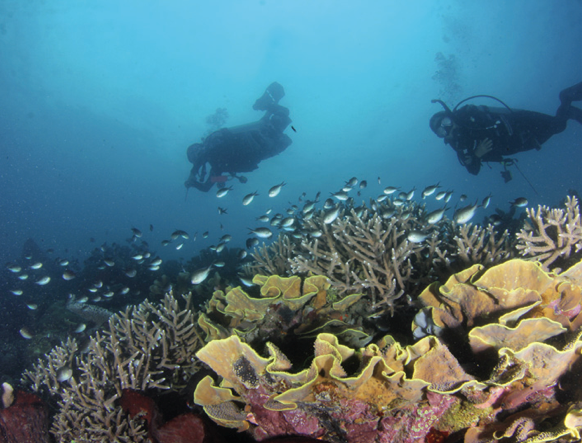 At various parts of the bay, divers can sight yellow fin tuna, dolphins, clown fish, lion fish, sergeant fish, sea turtles, whale sharks, cheilinus undulatos (Mameng), dugongs (sea cows), and an assortment of exotic aquatic life. Beach lovers will find a charming getaway in Gumasa Beach in Glan – a mile-long stretch of powdery white sand and crystalline water that serves as welcome quiet escape absent the madding crowds of commercialized beaches. 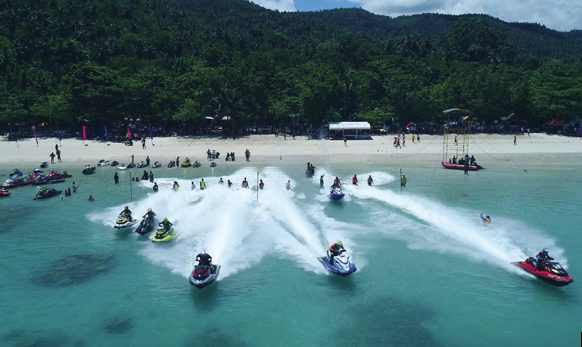 Come summer, though, it turns into a hive of wellness and watersports for the Sarangani Bay (SarBay) Festival, arguably the country’s biggest summer beach party. Sun-worshippers can also laze in the sun, sea and sand at Tuka Beach, a patch of powdery sand tucked at a secluded cove in Kiamba. Its piece de resistance is the marine park, a protected sanctuary where fishes spawn, making it a haven for snorkeling and free diving. After basking by the beach, one can hie off to the town’s upland area to chill and rinse at the refreshing waters of the three-tiered Bocay-el Falls which form icy natural basins. 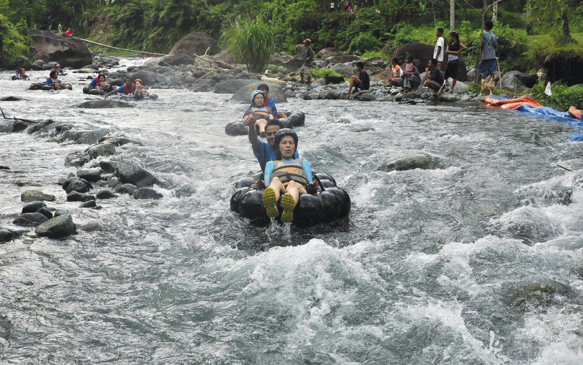 Another must-try water adventure is the two-kilometer white water tube ride at Pangi River where one can get an adrenaline rush along the waist-deep rapids. Situated at an interior village in Maitum, it is a community-oriented eco-adventure tourism project near the School of Living Tradition for Tboli tnalak weavers. 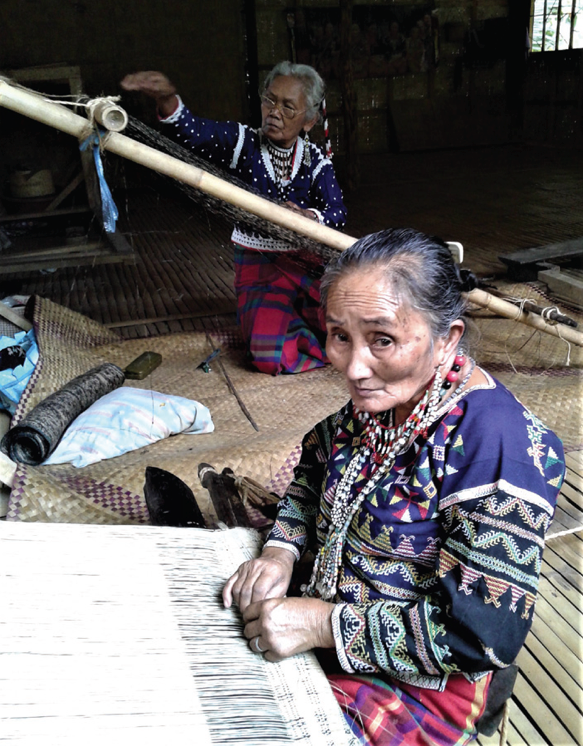 Guests can also indulge in the ancient art of weaving in Sarangani, a melting pot of indigenous lumad and Islamic tribes. With a rich tapestry from all cultural stripes, visitors can immerse with the Blaan tribes at Lamlifew Community Village Museum in Malungon town, the first of its kind in the country, which chronicles their ethnic heritage, organic agriculture, and the intricate mabal tabih weaving. Opened in 2007, this award-winning cultural project is as close as you can get to authentic Blaan way of life. Tucked in an interior village, guests are welcomed with a native dance by villagers clad in traditional regalia, to the beat of percussion instruments and the music of the two-stringed faglong guitar. The area’s core is the Gumusek (museum) and Fles Yu de Blaan (School of Living Tradition) where native women, some of them nonagenarians led by master weaver Gusiye Buan, spin the mabal tabih, an exquisite abaca fiber which is regarded as Sarangani’s crown jewel of cultural resources. 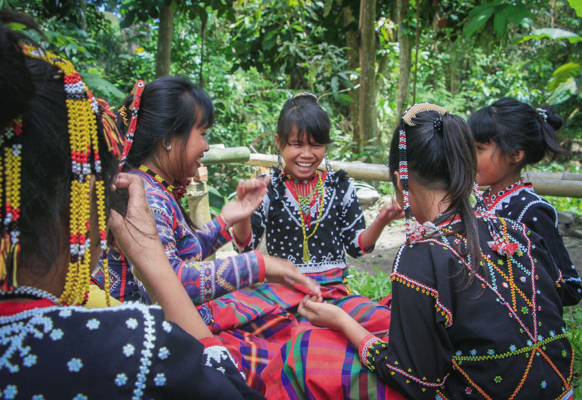 Further into the hinterlands is the Tagakaolo tribe, one of the lesser-known but equally colorful lumads of Mindanao who take pride in their own exotic tapestry. 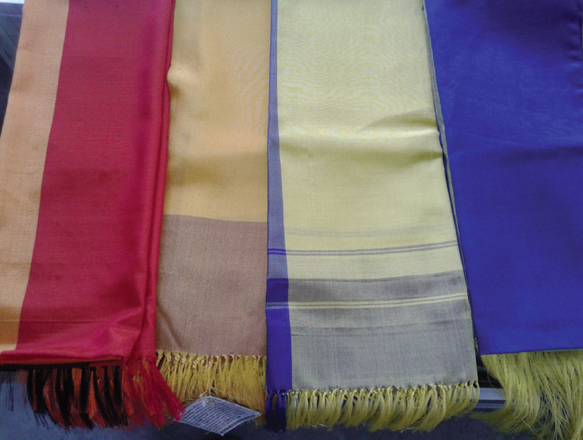 On the other side of the province is another gem of a fabric from the Maguindanaon community—the inaul. Handwoven by local women at the Balungis Weaving Center in Malapatan town, this silky fabric has found its way into the world’s prestigious catwalks as accents of Filipino haute couture. A unique craft is igem (mat) weaving by a Blaan community in the upland hamlet in Malapatan town, which is slowly getting public attention with the Gawad Manlilikha ng Bayan (GaMaBa) accolade given to its resident artist Bai Estelita Bantilan last year. Also known as the National Living Treasure Award, it is the highest recognition accorded by the National Commission for Culture and the Arts to traditional artists whose skills have reached a high level of technical and artistic excellence. With the unique confluence of weaves and waterworld, Sarangani is undoubtedly the consummate destination for culture and adventure. Sarangani can be reached by air via Gen. Santos City Airport. From there, the different towns can be reached by bus or van.